Lolak is the owner of Lolak Surf School, Surf instructor, Surf guide and photographer. Lolak has been surfing for over ten years and has great knowledge of all the surf breaks in Bali (including some secret spots they don’t tell the tourists about). Lolak is a professional and experienced instructor and will have you surf stoked and riding the wave in no time at all. Kocik was born in Berawa (a popular and consistent surf spot in Bali) and has been surfing the waves in this area and the surrounding spots for fifteen years. Kocik has ten years of experience teaching both beginner surfers and advanced surfers looking to chase the wave. He is a family man with a love for surfing and poodles. He has a calm and relaxed personality and enjoys a good laugh with the guests. Kocik is also proficient in speaking Japanese and English. Wayan Unyil was born in Kedungu (after Tanah Lot temple) he started surfing since his twelve years old and his pretty chill and relax. 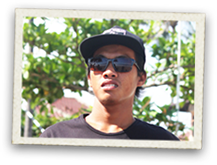 Wayan Unyil has over than fifteen years experience in surfing and speaking really good English. He promises to him self will teach two of his kids to be a good surfer and he loved tattoes and motorcross. Alvin is originally from Borneo, Kalimantan, but since living in Bali he has found a love and passion for surfing alongside his other hobbies architecture and reading. Alvin is an intelligent and spiritual guy and he has a deep connection with the ocean. 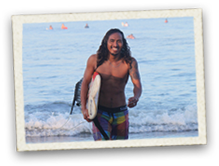 He is fluent in the English language and has many years experience teaching beginner surfers in the waves of Bali. Rachmat is originally from Medewi (West of Bali) and learnt to surf in the waves there. He has been surfing for ten years now and has been working as a surf instructor and surf guide for the last five years. 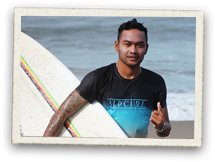 Rachmat is the youngest of all our surf instructors, a fun guy full of life and energy and a great motivator for all our guests!! !